Halloumi: ever heard of it? I’m kind of hoping not, because I take great pleasure in blowing people’s minds with the fact that halloumi is a cheese that you can grill. And I’m not talking about grilling it between two slices of bread ala grilled cheese—I’m talking about slapping it directly onto a piping hot grill and giving it a golden crust without it melting through the grates. Let us take a moment to thank the cheese gods for a cheese with a high smoke point. Halloumi originates from Cyprus, which is part of the Levant. If you’re familiar with hummus, fattoush, and baba ganoush, then you’re already familiar with some of Levantine’s tantalizing culinary culture. Though I’ve been enjoying those dishes for years, I only discovered halloumi last year. Grilled Halloumi and Burst Tomato Salad With Pesto. The first time I actually tried grilled halloumi was earlier this summer. I went to dinner with a few of my gal pals and one of them ordered these Greek halloumi sliders. She was kind enough to cut off a few extra pieces of her luscious grilled halloumi for the rest of us to try and good golly miss Molly, we were floored! It’s somehow firm yet tender; it’s salty; it squeaks like cheese curds when you chew into it. And, it pairs amazingly with fresh flavors which is why I opted to use it with some locally grown tomatoes and homespun pesto. Use up your summer bounty. By mid August, most people with vegetable gardens are wondering how the heck they’re going to use up their abundance of grape tomatoes, herbs, zucchini… and this recipe is one option! Of course I don’t have zucchini in this blend, but you could totally add grilled zucchini—it would work swimmingly. 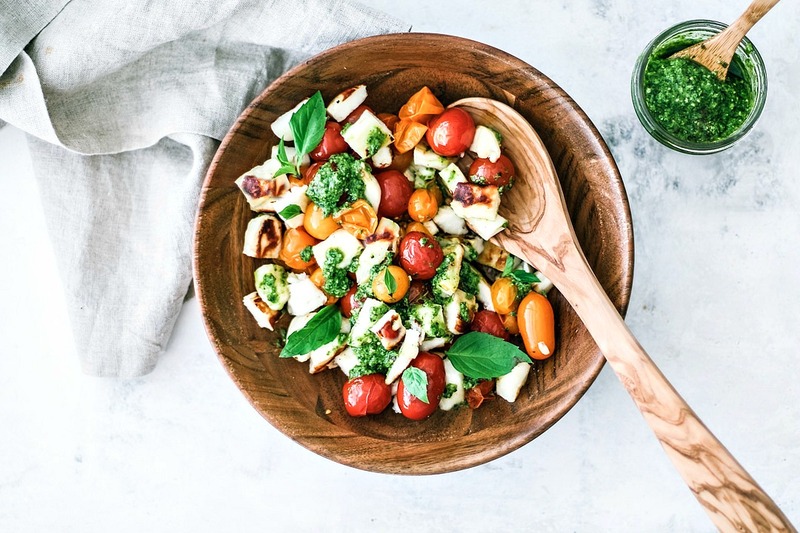 Grilled Halloumi and Burst Tomato Salad With Pesto is a great way to use up your summer bounty with fresh grape tomatoes, herbs, and even a homemade pesto! Pre-heat your grill to high heat and lightly grease the grates. Slather each side of each bread slice with a bit of olive oil and set aside. Rinse the tomatoes, shake them dry, and set them onto the tin foil. Drizzle a very small bit of olive oil over them and toss to coat. Hit them with some cracked black pepper. (I didn't bother using salt since halloumi is very salty). Place the halloumi directly onto the grill, followed by the tomato packet, and the grilled slices of bread. Depending on space, you may need to grill your bread in batches. The halloumi and bread slices should only need about 2-3 minutes per side, or until a golden color starts to form. So plan to grill your halloumi and bread slices for 2-3 minutes, then using tongs, carefully flip each slice over and grill for another 2-3 minutes. When done, remove and place on a plate or platter until the tomatoes are done. The tomatoes should only take about 6-8 minutes until the shrivel up and burst. When the tomatoes are done, remove them and bring everything back inside, or to wherever you're preparing your dish. Drain any excess oil from the tomatoes, then set them in a large bowl. Transfer the halloumi to a cutting board and cut the halloumi into small 1/2-inch cubes. Place the halloumi into the bowl with the tomatoes. Drizzle some of the pesto over the tomatoes and halloumi and give it a good toss. Use as much or as little pesto as you want. When done tossing, top with fresh basil leaves and serve with crusty bread and your favorite wine.